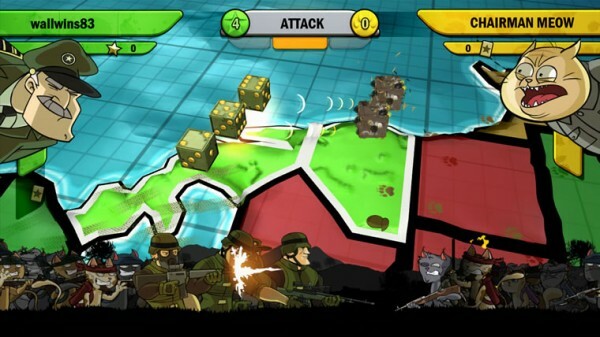 Risk: Factions was developed by Stainless Games and published by Electronic Arts. It was released June 23, 2010 and retails for 800 Microsoft Points. A download code for the game was provided by the publisher for reviewing purposes. Classic card and board games like Carcassonne, Catan and Uno have fared well on Xbox Live Arcade. Using the 360’s awesome online infrastructure and large user base has given these games new life and a constant stream of people willing to play the game together. Risk: Factions is the latest board game to make the transition to XBLA, and the final product is very good. For the uninitiated, Risk is a turn-based strategy game that features five warring factions: Humans, Cats, Zombies, Robots and Yetis. Players are given a fictional continent to fight over, with the purpose of expanding your own territory while taking over your enemy’s territory and capturing objectives. Dice rolls determine the outcome of a battle, so each one comes down to more chance than raw skill. The game manages to maintain the amount of strategy and risk (no pun intended) the classic game is known and loved for, and streamlines everything so that games don’t last for long periods of time while and adding a welcome touch of humor.